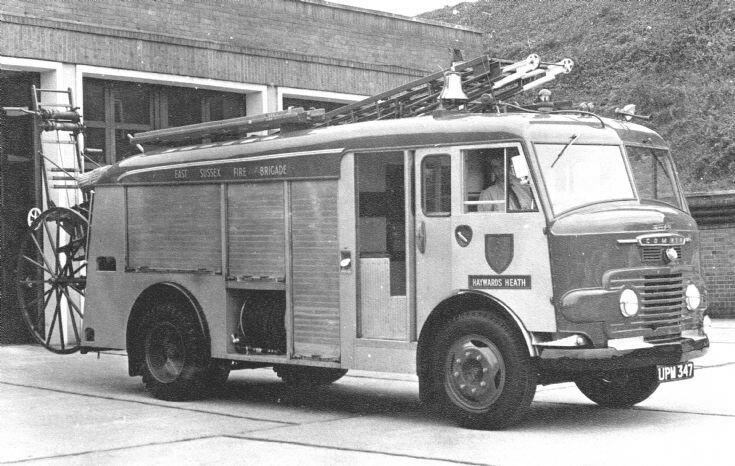 UPM 347 1961 Commer/Carmichael WrE (Water Tender Escape), East Sussex Fire Brigade, Haywards Heath fire station. Pre 1974 picture, Haywards Heath became West Sussex. On the first of April 1974 this appliance was withdrawn and spent some time on the reserve fleet. it was replaced at Haywards Heathrow by a Dennis F44 water tender ladder DBP 12G in yellow livery. Added by Bob Carver on 29 September 2016. Added by Jerry Hepworth on 18 December 2017. Very interesting Jerry did you take any other East Sussex pictures back then? Added by Michael G on 20 December 2017.